Butterflies, dragonflies, ladybugs, beetles...insects and bugs that crawl and fly, yet we love them in their natural beauty! Always a favorite theme in jewelry, handbags and gifts. Tiny 5/8 x 3/8 inch dragonfly in brass has embossed texture. Sterling post. Ornately cutout brass butterfly has 5/8 inch wingspan, dangles 1-1/8 inches including goldfill earwire and red bead drop. Ornately cutout silver butterfly has 5/8 inch wingspan, dangles 1-1/8 inches including sterling earwire and blue bead drop. 1-1/2 inches long including gold filled earwires, 3/4 inch across. Teardrop convex metal shape, lightweight, glimmering white backing. The artwork depicts monarch butterfly in golden orange and black. 1-1/8 inches long including silver earwire, 5/8 inch across. A hoop with turquoise enamel background has multicolor crystals and tiny glass beads with silvertone dragonfly charm on top. 15/16 inches long including sterling ear wire, 3/4 inch across. Silvertone metal charm of the company namesake, the firefly, has sparkling crystals in colors of tanzanite purple, coral, fuchsia, aqua and lime. Dragonfly pendant is 1 inch long, 5/8 inch across. Delicate and interesting, the dragonfly shape in silver metal is accented with glass and crystal beads in peachy rose, lime, teal and aqua. Suspended with dancing crystals across front 2 inches of steel chain, adjustable length 16-17.5 inches, lobster clasp. 1-3/8 inches long including sterling earwire, 5/8 inch across. Delicate and interesting, the dragonfly shape in silver metal is accented with glass and crystal beads in peachy rose, lime, teal and aqua. 2 inches long, 5/8 inch across, on sterling earwire. Silvertone dragonfly charm is part of a cascade below oval fuchsia/turquoise element. In the cascade are also a tiny bee charm and lotus flower, fuchsia and turquoise crystals. 1-7/8 inches long, 1 inch across. Goldtone earwire holds a dangling cluster of glass and crystal beads. The cluster joins the various shapes and sizes with brass wire and a central butterfly charm with a flourish of spiral wire below it. Bead colors include brown and gray. 5 inches tall, 3 inches across, a PERFECT size to give as a thoughtful GIFT to someone special! 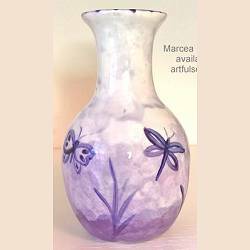 Handpainted in graduated background shades of purple into silver gray, with butterflies, dragonflies and reeds on top. Glazed purple inside and ready to hold water with flowers. Signed "Marcea" on the bottom (Marcea Reid of Henderson, Nevada), the vase is an earthenware lowfire clay that is food safe and water tight from the glazing and fired at almost 1900 degrees. 5 x 3-1/4 inch ornament made with nickel, brass and copper, Large and small butterfly amidst flowers and pearly beads of color are framed in circle. Metal pieces are soldered and wire-wrapped together, beads also are wrapped into the piece with wire. Comes on 2 inch silver hook hanger. 5/8 inch cast sterling silver dragonfly charm is suspended by one wing from delicate 16 inch sterling chain. The weighty feel and look of a coin, 7/8 inches cast in sterling silver with etched background and dragonfly, crescent moon relief covering the top. Oxidized and polished to bring out the details. Suspended from delicate 16 inch sterling chain. 1-1/2 inches long including nickel-free surgical earwire, 5/8 inch across. Misty blue enamel oval disk is like clouds in the sky, with silvertone dragonfly charm flitting above with slightly blue enamel wings, white pearl drop below. 3/4 inch round pendant has stainless silver case with stamped words "live laugh love" on the reverse side, so go ahead and wear it that way if you want! The artwork on the front, covered by clear resin, depicts tropical butterfly in oranges on turquoise background, with black and white drawing around the border. Comes on 18 inch stainless steel cable chain with lobster clasp.